Posted in: Monthly Updates. Tagged: bramwell, dreyer, house. YAY for house buying! 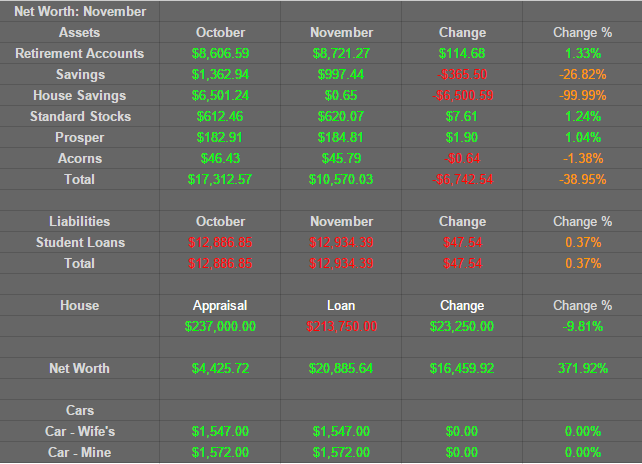 All our finances are everywhere but buying a house bumped up our Net Worth a ton! If you are in Portlandish area and looking for a house, I cannot recommend enough Joel and Janice Bramwell. Great people, dear friends, and amazing realtors :) And if you are looking for a mortgage advisor, Jeff Dreyer is the man. Honest, friendly, and extremely helpful! He broke everything thing down really well for us. Savings: This went down due to needing a little bit more money for down payment. House Savings: Obviously got drained… However, we will start putting away a little money into this account for a future house. Home ownership is expensive. But we are loving it so far. How did you guys do last month?